The Pickens Visitor Center, which opened in November of 2018, now displays a quilt block. These quilt blocks may be found all along the Upstate of South Carolina. To read more about the Upstate Heritage Quilt Trail, click here. 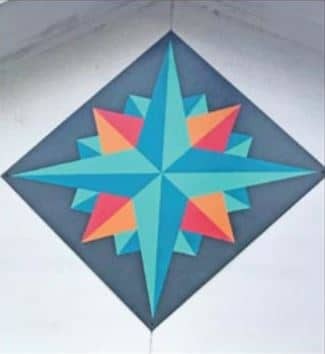 This particular quilt square is the Mariner’s Compass design, which dates back to 1726 when it was adapted from the compass rose that the Portuguese sailors would use to navigate. It just so happens to be one of the oldest named quilting patterns in America! Why this particular pattern? It was selected for the various visitors that would be exploring this Upstate county. The Mariner’s Compass represents direction and guidance during a voyage and what better message for those traveling through this fantastic area? The center is located at 222 West Main Street. Feel free to stop by and see all that Greater Pickens has to offer!